What I've always thought was missing from Episodes I-III is a character as colorful as Solo. I'm not big into Star Wars but would be one of the first in line for a Solo-Chewie movie. Perhaps they could make it an animation movie/series like Clone Wars. That way, Harrison Ford could still play Solo, and there would be more scope for adventure/action. 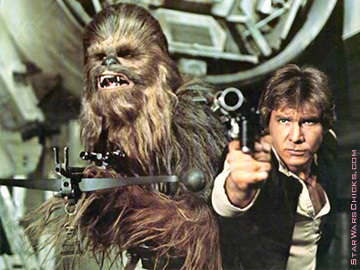 "Make a movie about Han Solo and Chewbacca in their early years. How did a Wookie prince become a smuggler? How did he meet Han? How did Han win the Millennium Falcon..."
Wasn't there already a show like that? Oh yeah -- "BJ and the Bear." What is missing in Episode I-III is fun and a sense of adventure. You had this in the orignial movies, but the most recent movies are almost film noir.